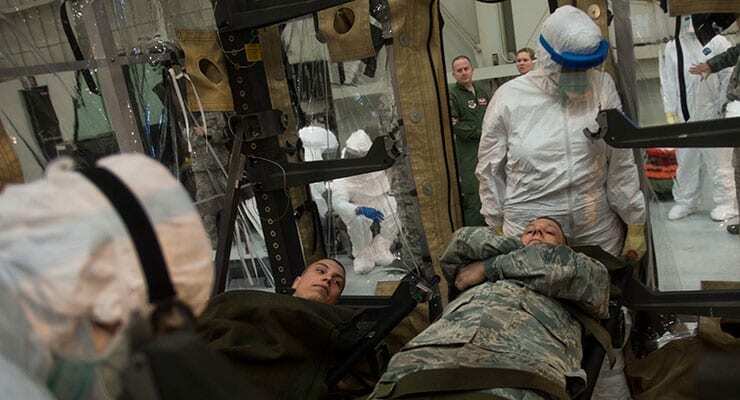 The U.S. Transportation Command has rolled out a new capability that will allow the Defense Department to use air transport to move multiple patients with highly infectious diseases. 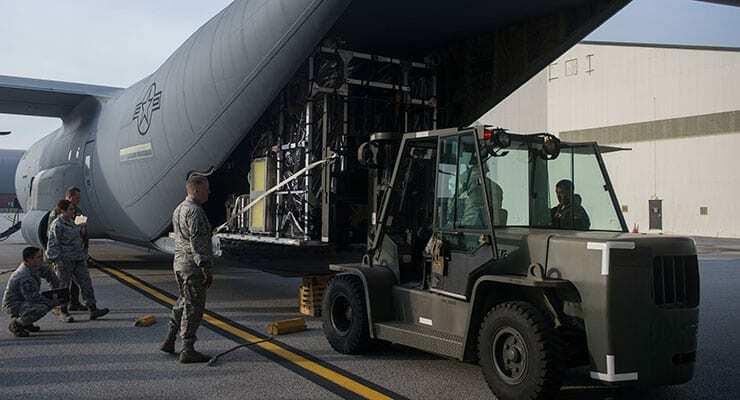 Air Force Gen. Paul J. Selva, TRANSCOM commander, introduced the Transport Isolation System (TIS) at Scott Air Force Base, Illinois, on Jan. 23. TIS has reached initial operational capability, and crews are trained and ready to deploy anywhere in the world in response to a biological event. The need for such a system came to light During Operation United Assistance, TRANSCOM officials said. Although a commercial company could transport patients, its capacity to do so was limited. A convergence of many agencies quickly moved on acquiring the system, including the Joint Chiefs of Staff, TRANSCOM, Defense Threat Reduction Agency (DTRA), Joint Project Manager Protection, Air Mobility Command, Air Force Life Cycle Management Center and Air Force Operational Test and Evaluation Center, among others. The Joint Chiefs approved a TRANSCOM request for urgent funding in September, and in less than four months, the TIS went from development through testing and evaluation into production. Air Force Maj. Gen. John P. Horner, DTRA deputy director; Barry Corona, president of Production Products; Air Force Maj. Gen. Scott M. Hanson, AMC director of operations; and Air Force Brig. Gen. (Dr.) Kory Cornum, AMC command surgeon, joined Selva in the public debut of the system. But it’s more than just a rapid acquisition-to-fielding success story, TRANSCOM officials said, adding that it also showcases the initiative and innovation of a small minority-owned business, Production Products of St. Louis, which manufactured the commercial isolation units that have been used to air transport patients and now produces the TIS. 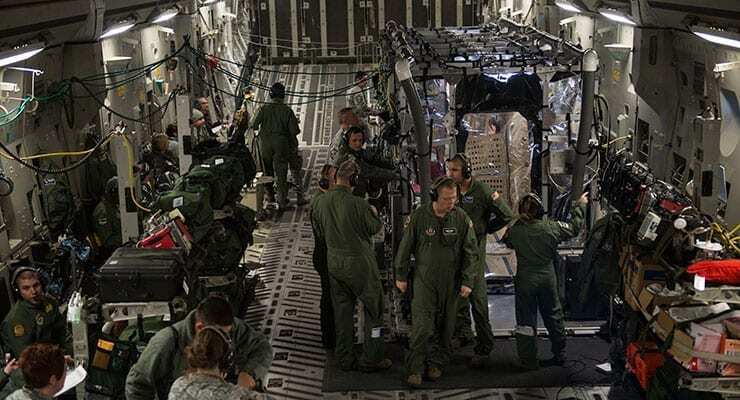 The system is built to fit on existing mobility aircraft, including the Air Force’s C-130 Hercules and C-17 Globemaster III transports, and is based on existing military patient support pallets. Each unit has a disposable liner supported by a metal structure and an air filtration system. “The infectious disease module provides us a safe way to bring multiple patients back,” Cornum said. Compared to the current Production Products system used on commercial air ambulances, the TIS is modular, buildable and capable of transporting up to three litter patients or four ambulatory patients in each module. This allows for flexibility in configuration; the standard configuration is for two seats and one litter. Two isolation modules and an anteroom module can fit on a C-17 or C-130J Super Hercules, and one isolation module and an anteroom module will fit on a C-130 Hercules. Each module is roughly 9 feet by 7.5 feet, is 8.5 feet tall and weighs less than 1,500 pounds, about the size of a minivan. The Defense Department has ordered 25 systems from Production Products, with expected delivery of all units by the end of March. Joint Base Charleston, South Carolina, has received the first two systems for training and staging. Additional staging locations for the TIS will be developed following delivery and based upon ongoing world events, officials said.